Get to know all the young stars of the latest Netflix original series. 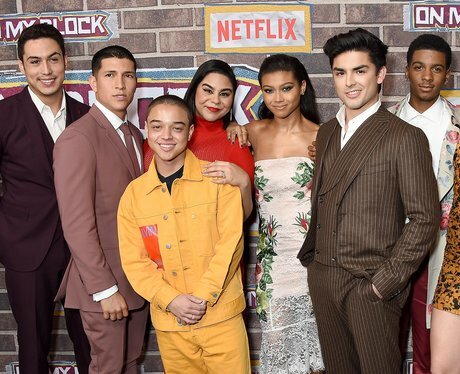 1. Who is in the cast of Netflix's On My Block season 2? Brett Grey plays Jamal Turner. He’s previously had roles in “Law & Order: SVU” and can also be seen in new NBC show, “Rise” as one of the dancers in the pilot episode. Julio Macias plays the role of Oscar ‘Spooky’ Diaz, Cesar’s brother and leader of the Santos gang. In real life, he does NOT look like Spooky. Did you even recognise him without all those tattoos?! Julio has had roles in “Jane The Virgin” and TV mini series “La Vida ed Como el Cine”. You can see him next in the film “The Last Boat To Alcatraz”. Jessica Marie Garcia plays the hilarious Jasmine. Jessica is an American actress hailing from Florida who you’ll probably know from all four seasons of Disney Channel’s Original series "Liv and Maddie”. She also had roles on “The Middle” and “Huge”. She is also a member of the all-female ensemble cast of "BETCH: A Sketch Show”. Jahking Guillory plays Latrelle, a member of the Prophets, the rival gang of the Santos. Jahking, who hails from California, is best known for his starring role in the 2016 film, Kicks. The 17-year-old was recently seen in Lena Waithe’s series “The Chi” as Coogie. Peggy Blow plays Ruby’s Abelula. She’s had iconic roles in both seasons of “American Crime Story”, “How To Get Away With Murder”, “Castle”, “Dexter”, “Criminal Minds”, “Desperate Housewives”, “That’s So Raven” and “Seinfeld” across a three decade career. Danny plays Ruby's older brother Mario. The 21-year-old actor made his television debut on Showtime's 'The Affair' followed by roles on NBC's Blindspot and the feature film, Rapid Eye Movement. He also appeared in Netflix's Orange Is The New Black and currently reoccurs as Wes on Fox's The Gifted. Ruby's mother Geny is played by Colombian American actress Paula Garces. You might have seen her on TV shows such as CSI: Miami, Law and Order: Special Victims Unit, The Sopranos, Devious Maids, The Good Wife and All My Children. Shoshana plays Mario Martinez's pregnant girlfriend, Amber. Shoshana has also appeared in 2 Broke Girls, Awkward. and The Secret Life Of The American Teenager. Maleah plays Paula, who works with Cesar and Jamal at the BBQ joint. She appears in season 2, episode 5. This is Maleah's first major TV show appearance. She is currently at university, studying Film and Television Production and Theatre. You can find her on Instagram at @maleah.goldberg. Ronni Hawk played Olivia in season one of On My Block. She does not appear in season 2. This is the second TV role for 19-year-old Ronni. She previously played the role of Rachel on the Disney sitcom “Stuck In The Middle” for 45 episodes before leaving the show to star on “On My Block.” Ronni - real name Veronica - is also a ballet dancer.